Demo version Ammonium Sulphate Market. Forecast for market development in the medium term (including three possible scenarios for development). South and Central America: Argentina, Bahamas, Bolivia, Brazil, Chile, Colombia, Costa Rica, Cuba, Dominican Republic, Ecuador, El Salvador, Guatemala, Honduras, Jamaica, Nicaragua, Panama, Paraguay, Peru, Trinidad, Uruguay, Venezuela. Add value to pitches and presentations by using official and accurate data and calculations. We have all the data for this report already available and the report is 75% ready and is in completion stage. With each License, you will get an Excel sheet with all the quantitative information in up to 1 working day after your purchase, which will allow you to start working with the data immediately! The final version of the research report will be presented up to 5 working days after your order. The report will be updated as of the current month of purchase. Feel free to contact us for more information! 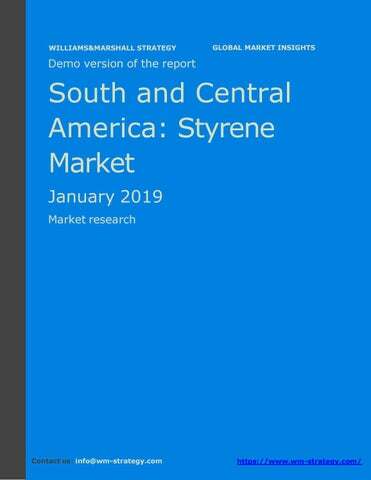 This is the most comprehensive report covering the styrene market in South and Central America currently available! We also offer similar reports, covering every global country, region and the world as an overall and offer special terms for bundle purchases. So, if you are interested in the styrene market in South and Central America, this research report will provide you with a strategic analysis of the market, its recent and future development. In addition, the report will save you time and money while presenting you all the necessary information, empowering you to make informed decisions and move your business forward! Research methodology The report on the South and Central American styrene market uses the unique WMStrategyâ&#x20AC;&#x2122;s research methodology that combines quantitative and qualitative analysis. 1. Analysis of official statistical information This report includes analysis of official statistical information from different public and private sources. The information is used for the interpretation and analysis of data on the volume and dynamics of different quantitative indicators. In the same way, the information is used as basis for building forecasts for the dynamics of the quantitative indicators for the next few years. The exact list of used sources of official information is available in the full report! 2. Analysis of information, received from the main market participants The collection and analysis of information, received from the main market participants is done mainly to understand their competitive positions on the market, to define and assess how different pricing and promotional strategies are utilized on the market and what competitive advantage each of them gives. This information is also used to analyze the assortment and brand presence on the market. The information, received from the main market participants include company presentations, annual reports, price lists, promotional materials, proposals, etc. 3. Analysis of secondary information from official sources The analysis of secondary information from official sources is used to make the picture of the market complete and full. The data is also used to verify the quantitative analysis and to enrich the qualitative one. Such information include data from industry portals and publications, trade associations, media agencies, articles and reviews, marketing agencies, commercial databases, WMStrategy own research studies. and special publications, whose work is directly related to this particular market on a daily basis. The format of the semi structured interviews allows us not only to cover the main questions we need to ask in order to understand the logic behind the market, but also to get new insights and to allow new ideas and factors to come into the picture. During the semi structured interviews, the market experts are asked about their views on the future of the market, which are taken into consideration while preparing our forecasts for development. The exact list of interviewed experts is available in the full report or upon request! 5. Semi structured interviews with corporate clients of the market Another way of looking into the specific market is through the point of view of the corporate clients. In this phase of the research, we are using semi structured interviews to understand the perspective of the high-volume clients on the market. This allows for unmatched wide and deep industry understanding. 6. WMStrategy own methodology The own methodology of WMStrategy can be found in every step of preparing our research studies from the methodology through the processes of collecting and analyzing information to drawing conclusions from it. 6. Overview and analysis of the styrene market in South and Central America 6.1.
differ from the real figures you will get by purchasing the full report! … Throughout the whole analyzed period, the usage had a relatively homogeneous structure. Most of the styrene regionally was used in the production of …, which in 2017 accounted for a share of about …% of the total in volume terms (…% in 2017). It was followed by use for the manufacture of … (with a share of …% in 2017), … and other usages (with shares of …% and …% in 2017, respectively). … In the medium term, the styrene consumption in the region is expected to grow the most in the production of …, which is expected to happen at a CAGR of …% per annum. It will be followed by the styrene usage for production of …, …, and …, which are forecast to grow at CAGR of …%, …%, and …% per year, respectively. The overall market volume is forecast to grow at a CAGR of …% per year to reach 1.084 million tons in 2023. … Another emerging trend on the styrene market is linked with developments in processes, products and applications for styrene polymers. Among the notable trends are customized nanostructured surfaces, weight reduction, improvements in application performance and safety, as well as the tailoring of commodity plastics to customers’ needs and their applications. In fact, styrene polymers continue to maintain their position in the global market due to continuous advances and innovations. For example, such developments are fiber optic systems made from highly transparent styrene polymers, nanostructured surfaces that possess superhydrophobic properties, and highly UV-resistant styrene polymers that are being systematically substituted for high-priced polymers. 7. Overview and analysis of the domestic production of styrene in South and Central America 7.1. As an overall, the South and Central American production of styrene in volume terms showed mixed dynamics in the period 2013-2017. In 2013, in South and Central America were produced 522 thousand tons of styrene. In the next year, the production increased by …%, which was followed by two years of decline. It happened at rates of …% and …%, respectively. In 2017, the production volume … by …% and reached … tons, which was its … value for the period. This was an overall … of …% for the last five years. Experts forecast that in the next few years, the South and Central American production will … at … rates of …% per year. At the moment, in South and Central America there are … styrene manufacturers. The report includes some of the leading manufacturers, ranked in terms of their overall installed capacities for the production of styrene as of 2017. … 7.5.1. Petroquimica Innova SA Petroquimica Innova SA is a Brazilian petrochemical company, which is known as a main player in the styrenic business. The company operates two plants, one in the Manaus Industrial Pole (Amazonas) and one in the Triunfo Petrochemical Pole (Rio Grande do Sul, south of Brazil). According to the company’s own information, the plant in Triunfo is the only in the country to integrate, in the same plant, production of ethyl benzene, styrene monomer, toluene, crystal and high impact polystyrenes, as well as expandable polystyrene. … In the fiscal 2017, the company reported revenues, amounting to … USD, which was a … of …%, compared to the previous year. As far as net income is concerned, Petroquimica Innova SA recorded … USD, compared to … USD in the fiscal 2016. … Table 10 Installed capacities for the production of styrene by Petroquimica Innova SA, broken down by countries in South and Central America in 2013-2017, in thousands of tons and in % Prod. … The average annual prices of styrene in South and Central America in the period 2013-2017 showed … dynamics. In 2013, one ton of styrene, purchased directly from the producer cost about … USD in South and Central America. In the next four years, the indicator recorded steady … with only one exception in 2014, when it … by …%. Its … rates in the other years were …%, …% and …%, respectively. So, in 2017, the average producer price reached … USD per ton, which was an overall … of …% for the period. Experts expect that the average producer prices will … in the next five years at … rates of …% per annum. … Due to the high domestic supply, the domestic demand is … to cover it fully, so the local balance between supply and demand in volume terms was … with domestic supply being able to cover …% of the domestic demand in the last five years. In value terms, the situation was very similar, but had different dynamics due to the different per kilogram prices of the styrene, produced in South and Central America and the imported ones. In value terms, the balance between domestic supply and domestic demand was …, as the domestic supply was able to cover …%-…% of the domestic demand in the last five years. … In the last five years, the South and Central American styrene market was dominated by … and this trend will continue in the medium term. Due to the …, the market will show … in the period until 2023. Understandably, this will happen if the overall South and Central American economy is able to achieve … of …% per year and…. … Under the base scenario for development, the South and Central American economy will show … rates of about …% per year until 2023…. In this scenario, the annual market … rate for the period will be about …% per year, which means that the market volume in 2023 will reach 1.084 million tons or … million USD. As well as a global report, covering all of the above. 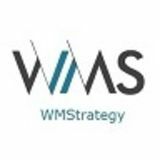 About us Williams & Marshall Strategy (http://www.wm-strategy.com) is a global full-service market research and consulting company, providing market insight and analysis on a wide range of industries and markets. Our unique research methodology combines quantitative and qualitative analysis and covers the whole value chain of the markets we analyze – from manufacturers and distributors through wholesalers and retailers to the final clients, which allows us to provide unmatched wide and deep industry understanding. Thus, our clients receive actionable insights on the volume, value and dynamics, trends, growth drivers, threats and opportunities of each market – intelligence that helps them be always a step ahead of the competition. WMStrategy’s reports help our clients make informed commercial planning and strategic decisions and so timely tackle the complex challenges and maximize the opportunities that impact their businesses and drive the generation, evaluation and implementation of powerful growth strategies. We are constantly enhancing our research skills and coverage by improving our work and adding new experts and geographical markets to our portfolio, making our products an essential resource for companies at global, national and local level. Our reports free up your resources and offer you timely deep industry understanding and strategic insights, required in today’s increasingly competitive business environment. Our clients As a global company, we are dealing with a very diverse client base. The companies who trust us come from different geographical regions and from different backgrounds â&#x20AC;&#x201C; we have clients, ranging from large, developed economies like the USA, the UK, Germany, France, Italy, Australia, Canada, Japan, etc. to developing countries like Chile, Nigeria, India, Indonesia, Bulgaria, Poland, Russia, etc. Our clients come from different industries â&#x20AC;&#x201C; from mining and agriculture through processing and manufacturing to different types of consulting and financial services. They vary from large Fortune 500 companies to small start-up ventures. You can find a sample list of some of our recent clients below10 (provided in no particular order). right to represent any of the above mentioned companies.